Looking for a very large bow? This is the one for you! It has three layers of grosgrain ribbon and plenty of ribbon with polka dots running through the middle. This has lime green, navy blue and white colors. 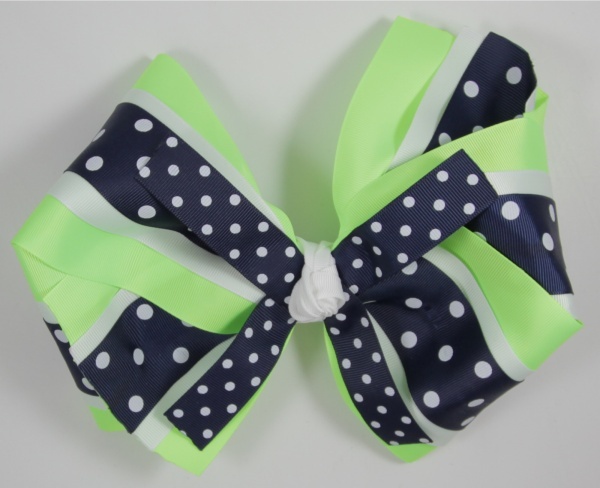 The layers go from a bottom 4", to 2.25" white, and then a 1.5" navy with white polka dots for the main bow. Then a 7/8" polka dot flares run through the center and a white grosgrain wraps the center in a French knot. Bow is attached to a large French clip. Over sized and polka dots all wrapped up into one!